Even though some states with the largest Hispanic populations were not part of the most competitive midterm election contests, the Latino vote still mattered. Gearing up for the election, pollsters, journalists and politicians wanted to know how the Hispanic vote would shape the overall results. Would Latinos turn out to vote in greater numbers this year? Would the lack of action on immigration reform by President Obama and Congress depress voter turnout, or raise it? Here are five takeaways about Latino voters in this year’s elections, based on exit poll data. 1Democrats won the Latino vote, but Republican candidates gained a sizable share of this electorate. In several Senate and governor races for which exit poll data are available, we know this is true. For example, in gubernatorial races in Georgia and Texas, Republican candidates won more than 40% of the Latino vote. In House races nationwide, there was little change from the previous midterm election. Some 62% of Latinos voted for Democratic House candidates nationwide, compared with 36% who voted Republican, the national exit poll shows. The Democratic share is similar to the last midterm election in 2010, but down from 2012, when the advantage over Republicans was 68% to 30%. 2 Hispanics made up 8% of the nation’s voters, the same as in 2010 and 2006, according to national exit polls. Measuring the demographics of voters is difficult using exit polls. Nonetheless, they can be useful when examining trends. 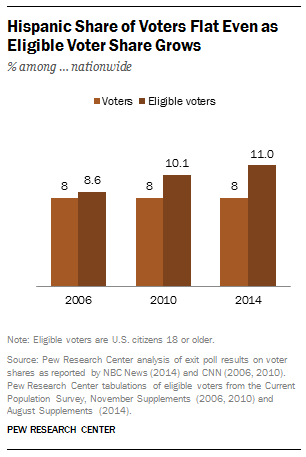 Even as the Latino vote remained flat at 8%, their share among eligible voters has grown from 8.6% in 2006 to 11% this year. (The number of Hispanic eligible voters has reached more than 25 million today, up from 17.3 million in 2006.) This suggests, but does not show, that voter turnout among Latinos may not have surged this year. Indeed, some analysts say voter turnout among the general public nationwide may be equal or down from 2010. 3 The economy was, by far, the top issue for Latino voters. About half (49%) of Latino voters called it the most important issue facing the country, according to the national exit poll. Health care (24%) and illegal immigration (16%) followed. These findings mirror other surveys. For example, our survey has produced similar rankings of the issues over the years. Even though immigration is not the top issue for Latinos, it remains an important one. Two-thirds (66%) of Latino registered voters say passing new immigration legislation soon is extremely or very important, according to the center’s 2014 National Survey of Latinos. 4It’s not clear whether President Obama’s executive action delay on immigration swayed Hispanic voters one way or the other. Obama did not deliver on a promise to offer deportation relief to some of the 11.3 million unauthorized immigrants in the U.S. by September, instead pushing any action to after the election. The 2014 National Survey of Latinos found Hispanics have mixed feelings on the decision. About a third of Hispanic registered voters (35%) say they are either disappointed or angry with the president’s decision, compared with about one-fourth (26%) who are very happy or pleased. And one-third (32%) say they have heard nothing at all or don’t know about the president’s decision. Plus, about half of Hispanic registered voters (54%) say a candidate’s position on immigration is not a deal-breaker in determining their vote. 5In state elections, Republicans won most races for which exit poll data are available, even though they lost the Latino vote. For example, in Florida, Gov. Rick Scott (R) won re-election with 38% of the Latino vote, a significant drop from the 50% he won in 2010. Demographics may have also played a role. Latinos made up a small share of eligible voters in states projected to be competitive this year. Nonetheless, there is potential for Hispanics to impact elections. Latinos have played an important role – twice – in helping President Obama win the presidency. In 2016, if the battleground states for president remain the same as during the Obama years, the impact of the Latino vote is expected to be more significant.